A powerful image editor and photo enhancer software. Its excellent abilities to correct digital photos, it has many rich tools and effects found just in much more expensive tools. Focus Photoeditor makes it easy performing photo correction. Besides its excellent ability to correct digital photos, it has many rich tools and effects found in much more expensive professional tools. And there are also many tools you can hardly find elsewhere, such as Quick Fix Wizard, Effective and Intelligent Automatic Corrections, Smart Color Replacement and extras like a web-album builder, a batch processor and support for photoshop plugins. Focus Photoeditor has all the necessary tools for editing and adjusting digital images. Quick Fix Wizard, Adjusting levels, Gamma, RGB curves, Hue-Saturation, Brightness-Contrast, Shadows-Highlights, Histogram stretch and more. When coming to automatic corrections the software excells over any competitor: you will find Quick-Fix, Auto-Contrast, Auto-Stretch, Auto-Colors, Apply Smart Flash, Reduce Hilights and many others. 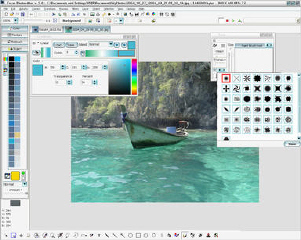 Focus Photoeditor provides Layers that are very useful to create any kind of graphic project. Joining together different pictures and photos and combining them transparently and with different blend modes, you will be able to create easily professional looking greetings cards, calendars, business cards, web graphics and much more. Besides the many built-in filters, the program support thirdy parts plugins written with the adobe photoshop plugin standard. Loads fast, letting you immediately start to edit your pictures. Has a very comprehensive and professional set of features. Has the best set of Automatic Photo Corrections available on the market. High quality photo correction algorithms, which are also finely tuned. An example is the new Unsharp Mask filter. Has a very easy to use Batch Processor with undo capabilities. Supports powerful ways of creating Selections and has separate undo history for them. Very comfortable picture browser: lets you rotate, make backup copies, copy&paste, print picture files in a sheet. Version 5 is now a lot FASTER, has improved algorithms, new features and a completely renewed skin. Active Photo Editor - Software for image editing and image effects creation. It supported image formats: BMP, JPEG, GIF, PNG, ICO. It can capture screenshots, edit images, draw lines and shapes. ImageTasks 1.6- A powerful tool for editing, adjusting, converting images. It also includes Batch Edit for processing large sets of images, HTML Album. Twisted Grille for PocketPC - A image editor with a built-in blogging client. This software allows you to spice up your photos by adding hilarious clip art and other fun accessories. WinCal - As we say, it is your personal photo calendar, Certificates and advertisements design and publishing tool. Using WinCal you can very easily design and print your own photo calendars and or photo adverts. Zoner Photo Studio 10 Professional - Zoner Photo Studio 10 is made for user of digital cameras, scanners, and mobile devices. It's a tool that can lead you through the whole process of managing and processing digital photos: acquiring, editing, archiving, and publishing them. eCover Engineer - eCover Engineer is an ecover generator product. Design ebook covers, CD covers, DVD covers and software box covers with minimum costs. GSA Photo Manager - With the GSA Photo Manager the selection of your favourite photos is a breeze, whether for organizing slide shows or simply for viewing and selecting photos. AcadExcel - An AutoCAD Add-In, designed for process table in AutoCAD. You can create, edit, modify or import table for AutoCAD drawing quickly and simply.